Enter any non-winning Frogger scratch game ticket for a chance to win $1,000 cash, PlayStation Pro 4, & Frogger Game. 3/25/2019 at 12:01 a.m. MT until 11:59 p.m. MT on Official End Date of Game. The Lottery will post the name of the winners on the website no later than 3:00 PM within three business days of the Official End Date of Game. To enter, go to vip.idaholottery.com and sign-up or log-in. 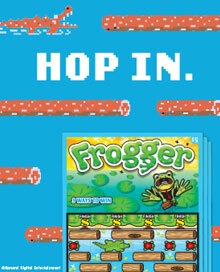 Click on the “Promotions & 2nd chance tab” then look for the Frogger image. Enter the 14-digit ticket number of any non-winning Frogger scratch game ticket. If you do not have web access, you can enter through the Lottery tele-entry system at 208-334-4656. Only Tele-Entry and on-line (Internet) entries will be accepted. Mail in entries will NOT be accepted. It is the player’s responsibility to enter the correct ticket numbers and contact information. You must be an Idaho Lottery VIP Club member to enter through the website. Players are responsible to ensure their VIP and contact information is current. The Lottery will not enter any information for any person. The Lottery cannot make any changes to any entry. One ticket is considered as one (1) entry. You may enter each ticket only once. Duplicate entries will be disqualified. You must keep your entered tickets for presentation to Lottery Officials for winner/entry verification. Prizes will not be awarded without verification of the ticket from the winning entry. Entries will only be accepted from 3/25/2019 until the Official End Date of Game at 11:59 p.m. MT. All prize fulfillments are subject to compliance with any State, Federal or local laws. The Lottery will post the name of the winners on the website no later than 3:00 PM MT within three business days of the Official End Date of Game. The Lottery will attempt to contact the winners by phone immediately after the draw. Only persons 18 or older can enter or participate in any Lottery promotion. Each winner must contact the Lottery within seventy two (72) hours of notification. Posting or announcement of winner drawn does not confirm winning status until the winner and winning entry have been verified by Lottery officials. the winner cannot be notified due to incorrect or lack of contact information. the winning entry cannot be verified by the Lottery. the winner has not contacted the Lottery within the required time. the winner cannot accept or participate in the promotion. the tickets entered were illegally obtained or if a violation of any law or rules has occurred. the winner is not of legal age to participate. You must be 18 years of age to buy, sell, or redeem Lottery tickets in Idaho. Persons under 18 cannot participate in any Lottery promotion, giveaway or game. Each winner will have seventy two (72) hours, after the winner’s name has been posted on the website, to contact the Idaho Lottery Customer Service. Every effort will be made to contact winners by the phone number provided by the entrant. The Idaho Lottery will post the name of the winners on the website no later than 3:00 PM within three business day of the Official End Date of Game. In the event a named winner is disqualified or does not step forward to claim their prize within the required time, the named winner will forfeit their claim to the prize and an alternate will be chosen and contacted. The alternate will then have forty eight (48) hours from notification to claim their prize. Contact the Idaho Lottery Customer Service at 208-334-2600. Sign and complete the information on the back of the selected ticket. The winner must present the selected ticket to Lottery Officials to process their claim. Possession of the selected ticket is the only method the Lottery has to verify your claim. You must complete and sign a claim form and a claim form addendum. You can get these forms from the Idaho Lottery website (www.idaholottery.com) or request them from the Lottery office. When you visit the Lottery office in Boise, you will need the selected ticket, completed claim form and claim form addendum along with government-issued photo identification. You must also complete and sign a claim form and a claim form addendum. You can get these forms from the Idaho Lottery website (www.idaholottery.com) or request them from the Lottery office. Make a copy of your photo identification. Fax the copies of the selected ticket, completed claim form, claim form addendum and a copy of your government-issued photo identification to the Lottery at 208-334-2610.